Notice: This is an English translation of the Japanese article on May 25, 2018. From May 11 - 14, asteroid Ryugu was imaged using the Star Tracker onboard Hayabusa2. This data was then used for the application of optical navigation towards the asteroid in this mission. 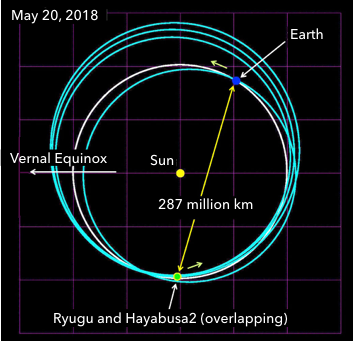 Figure 1: The location of Hayabusa2 on May 20, 2018, relative to other celestial bodies projected onto the ecliptic plane. The vernal equinox occurs when the Earth is at the right-side of the Sun and celestial bodies revolve around the Sun counter clockwise. Figure 2: Location of Hayabusa2 and Ryugu on May 20, 2018. This figure shows the vicinity of Ryugu in Figure.1. The orbit of a planetary explorer like Hayabusa2 is usually estimated by communicating with the spacecraft via radio waves. The technical term for this method is RARR: Range And Range Rate. "Range" is the distance from the Earth to the spacecraft and is calculated by measuring the round-trip propagation time of radio waves sent from Earth to the spacecraft and back. "Range rate" is a measurement of the velocity of the spacecraft along the line-of-sight: along the direction to the spacecraft when viewed from Earth. It is calculated from the change in frequency of the transmitted and received radio waves. This effect is commonly known as the "Doppler Effect" and is experienced every time a loud vehicle such as an ambulance passes you on the street. As the ambulance approaches, the sound waves from the siren get bunched together, which increases the frequency of the wave and raises the pitch. When the ambulance retreats into the distance, these sound waves are stretched and their frequency decreases, lowering the pitch. Measuring this frequency change would allow you to estimate the velocity of the ambulance. Likewise, the change in the radio wave frequency from Hayabusa2 allows us to measure the velocity of the spacecraft. The RARR method can measure the spacecraft's position at 300 million km away to around 300 km. But this is not good enough to arrive safely at Ryugu! For Hayabusa2, we can use an orbit estimation method called DDOR in addition to RARR. DDOR stands for "Delta Differential One-way Range" and can also be referred to as "relative VLBI", where VLBI is "Very Long Baseline Interferometry". Unlike RARR, DDOR uses two different antennas at widely separated Earth ground stations to receive radio waves from the spacecraft. The difference between the times measured for the radio waves to reach to each station can be used to obtain a more accurate estimate of the spacecraft position. Ideally, this time difference would depend only on the distance between the ground stations. However, delays can also occur due to variations in the Earth's atmosphere. To compensate for this, very distant radio-emitting celestial objects known as "quasars" are also observed. Any distortion due to atmospheric and ionospheric (the upper part of the Earth's atmosphere) can be subtracted from the signal from the spacecraft to get the probe's true distance. DDOR allows the position of Hayabusa2 at 300 million km to be measured to a precision of about several kilometres. The DDOR measurement for the position of Hayabusa2 is excellent, but there is also uncertainty in the measured position of Ryugu. Since Ryugu cannot transmit radio waves to Earth (and is too distant to allow radio waves to be reflected via radar), DDOR cannot be used to gauge its position. 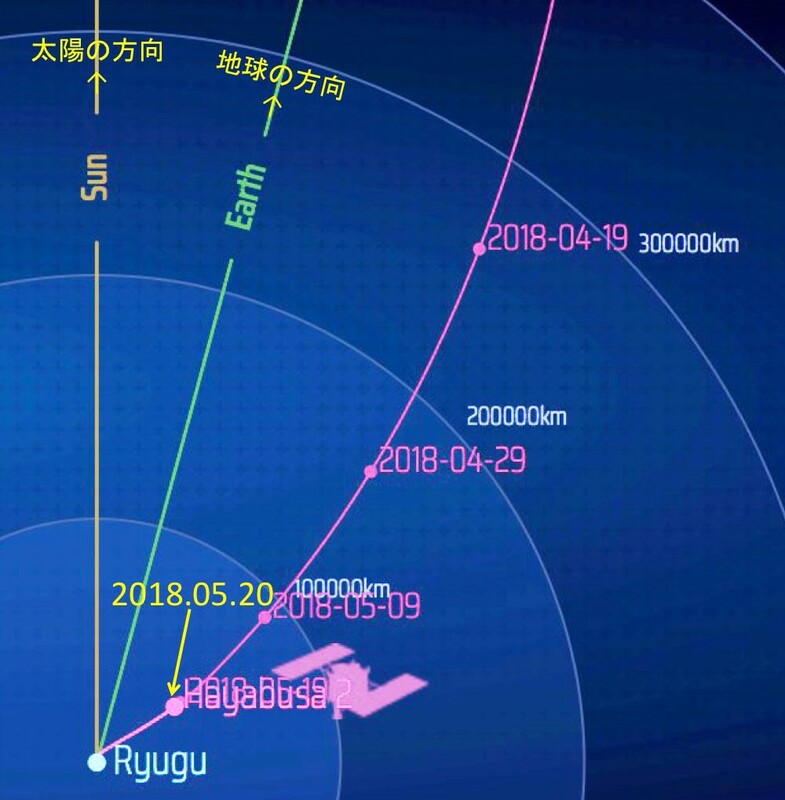 On May 2018, the position of Ryugu was estimated to within 220 km. This means that even if the position of Hayabusa2 can be estimated to within a few kilometres, it would still not be possible to arrive at Ryugu. This is why we need to use optical navigation. Optical navigation uses knowledge of the direction of Ryugu from the spacecraft to estimate more precisely where the asteroid currently is on its orbit. This is then used to improve the predicted trajectory of Ryugu. To acquire the direction, Ryugu is photographed using a camera onboard Hayabusa2, producing an image containing both the asteroid and background stars. The position of the background stars is precisely known, allowing the direction to Ryugu to be measured. Optical navigation was employed when Ryugu was imaged using the Star Tracker, an instrument usually employed to estimate the orientation of the spacecraft. A schematic diagram of how finding the direction to Ryugu improves knowledge of the asteroid's trajectory is shown in Figure 3. The blue oval shows the original region prior to optical navigation where Ryugu could potentially lie. By knowing the direction of Ryugu with respect to the background stars, that error range can be shrunk to that indicated by the red brackets. This allows Ryugu's future trajectory to be known with greater precision as Hayabusa2 continues to approach the asteroid. When we do this in practice, we are able to simultaneously analyze the radio wave and optical navigation data to estimate the orbits of both Hayabusa2 and Ryugu. Figure 3: The principal of optical navigation by Hayabusa2. Let's look at how well this works in practice with the images of Ryugu taken by the Star Tracker. 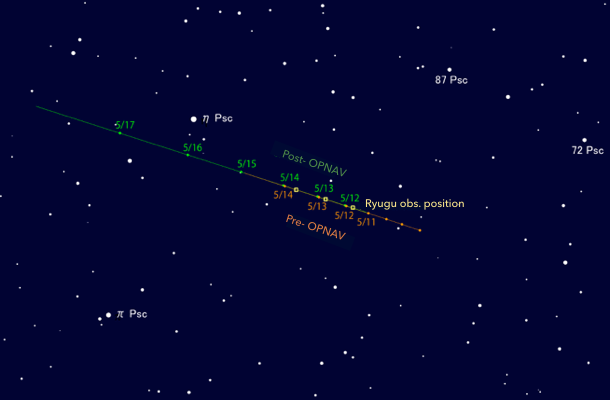 Figure 4 is the starry sky seen from Hayabusa2, where Ryugu's expected position over the course of about a week is shown by the line. The orange and green lines and points show the estimated path of Ryugu before and after the trajectory of the probe and asteroid was improved via optical navigation. Yellow points show the actual observed position of Ryugu. 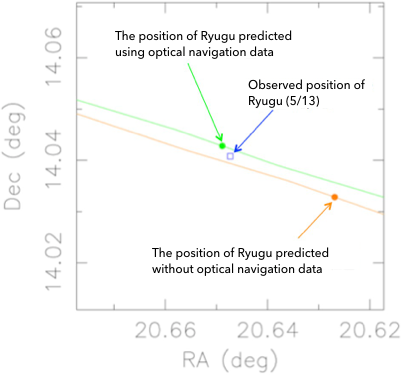 On the scale of Figure 4, the expected orbital path of Ryugu before and after optical navigation overlap with the actual observations, so it is not possible to see how much optical navigation improved the predictions. Figure 4: Results of the optical navigation with the Star Tracker. Orange: Expected position of Ryugu seen from the spacecraft calculated from orbital information prior to using optical navigation. Green: Expected position of Ryugu calculated with greater accuracy using optical navigation data. Yellow: The direction of the observed Ryugu. In Figure 5, we enlarged the observed area around the 5/13 (May 13) point in Figure 4. In this figure, the expected position and trajectory of Ryugu before and after the optical navigation data was used are plotted along with the observation of Ryugu at that time. The deviation from the true location of Ryugu is much smaller after collecting the optical navigation data. Figure 5: The effect of optical navigation. This is an enlarged region of Figure 4, centered around the position of Ryugu observed on 5/13. Also shown is the estimate of the asteroid's orbit and position at this time using data before and after optical navigation was employed. The trajectory estimated using optical navigation is closer to the true observation of position. After the use of optical navigation in May, the uncertainty in the spacecraft position was 3 km, and the uncertainty in the position of Ryugu was 130. This error was still large, but it was not a problem. During this use of optical navigation for Hayabusa2, the spacecraft was still using its ion engines, so the optical navigation result was being used to determine the direction and magnitude of this thrust. At the beginning of June, the period of ion engine operation ends and more precise optical navigation using the onboard Optical Navigation Camera (ONC) will begin. This will ensure our arrival at Ryugu. Hayabusa --our first mission to the asteroids-- also used optical navigation before arrival at asteroid Itokawa. As with Hayabusa2, the first step was an image taken with the Star Tracker. The article (in Japanese) reporting this event on August 15, 2005 can be found here. The situation for Hayabusa was slightly different to that for Hayabusa2. For the Hayabusa mission, the uncertainty in the position of asteroid Itokawa was smaller than that for Ryugu. This is because radar observations of Itokawa had been possible, allowing the trajectory to be predicted more accurately. Due to Ryugu not approaching the Earth close enough for radar observations since its discovery, the accuracy of the asteroid's orbit is not as good. On the other hand the accuracy of the trajectory of the actual spacecraft was far worse for Hayabusa than for Hayabusa2, as there was not the capacity to properly use DDOR. 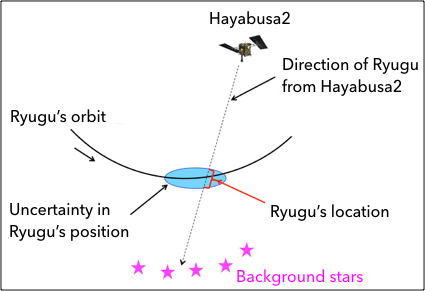 Therefore, to reach the small celestial body of Itokawa, whose size is only about 500 m, we had to use optical navigation to increase the accuracy of orbit predictions for Hayabusa.